"Do you think that Sri Krishna (who brought back to life several dead people) will not be able to protect himself?" PEOPLE lost all hope in the efficacy of allopathic medicine. As an alternative they invited T.S. Iyer a homoeopath whose treatment at first resulted in some improvement. Bhagavan was shifted from the hospital to the small room opposite the darshan hall, where he resumed granting darshan sitting in the verandah of the room. Veda parayana also commenced. Jayanti came off on 5 January 1950 but the joy associated with it was absent. In the middle of February another tumour showed up just below the place where the previous one was. Dr. Raghavachari and others said that it was also malignant brushing aside the homoeopath's view. So homoeopathy was discontinued and an Ayurvedic physician Dr. Moos from Kerala was summoned. He also tried his hand but with no success. The tumour began growing and Bhagavan became weaker and more anaemic. body. Vasishtam says, "It makes no difference to a jnani [?] whether sandal paste is applied to the body or a limb is severed." Still some others said that as Bhagavan never complained of pain he could not have had any. Another comment was that by the power of his tapas [?] Bhagavan ensured that he had no pain at all. All these comments were based partly on philosophy and partly on illusion. The symptoms of pain such as lack of sleep were noticed by several people. Bhagavan was also heard groaning in pain. 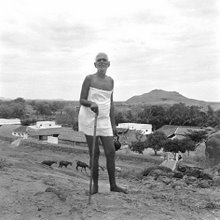 It is as absurd to say that the body of a jnani [?] did not have any pain as to say that no blood would spill if his body is cut. No individuality is left, therefore, even if the body suffered there would be no individual to experience that. The body is made up of the five elements and suffers its pain. Those who identify the jnani's body with the jnani [?] are bound to say that he also suffers pain. What we should focus on is how the body's pain was being borne. Though we say apparently that Ramana's body was different from Ramana's jiva [?] we are unable to conceive that the person known as Ramana was absorbed in Brahman. On this basis therefore the extraordinary tolerance Ramana showed was unique to him. Or it could be that Bhagavan might have felt that if he were to show his suffering his devotees would not be able to bear it. As far as possible he resisted showing any sign of his pain and his body continued to play its role as usual to the extent feasible. He would take his bath as usual before sunrise and at the appointed hours both in the forenoon and afternoon he would read the letters of the Ashram. He gave darshan to devotees and supervised the publication of books. But after January the body could not do even this. Gradually he lost all energy to grant darshan outside the small room as a result of which devotees would walk past the room where he lay and had darshan. Even by March-end there was no improvement and it was decided, with Bhagavan's approval, to invite an Ayurvedic doctor (Kaviraj) from Calcutta. The Kaviraj gave treatment for some days and after suitably instructing a local ayurvedic physician, returned to Calcutta. But this physician felt that the medicines were too powerful for him to administer. He wanted the assistance of another physician from Calcutta. Bhagavan could not tolerate this anymore and declined to take any medicine after 12 April. Meanwhile, he had an attack of asthma and when one of his relatives attempted to give some medicines Bhagavan prevented him saying "Why bother? Everything will be over in two days." Everyone drew hope believing that Bhagavan had decided to cure himself. But what they could not guess was that what was to depart was not only the disease. it at first but seeing the sorrow on the doctor's face agreed to have a few sips. He took just two spoonfuls.
" A few tear drops trickled from his eyes on listening to it. Later the dreaded moment arrived. Bhagavan opened his mouth to breathe, the mouth remained like that, the breath stopped and Bhagavan shed his mortal coil. It was Friday night, 8-47 p.m. The devotees outside kept singing Arunachala Siva, Arunachala Siva. Arunachala hill reverberated with that sacred name; at that very moment a brilliant shooting star traced its way across the skies towards Arunachala. People in distant places saw its appearance. Ramana Jyoti left its temporary abode, the earth, and returned to its natural place of stay. Witnessing the bright light people in the town suspected the worst and rushed to the Ashram. Their father, guide, guru and their all was no longer there. He had left his body. the holy body was bathed in holy waters, milk and honey; a huge crowd witnessed it. A little later the body was decorated and lowered into a pit dug between the Matrubhuteswara shrine and the old darshan hall. The pit was filled with salt, camphor, and other aromatic substances. There were hundreds of people in the Ashram that evening  all that they experienced was desolation, the mind was benumbed. "In your absence this world now resembles a dilapidated house," said a poet. How true! On Bhagavan's advent on the earth there was a light seen only by a blind lady. He departed in a blazing trail of light seen by hundreds of people. That night the stars in the firmament shone with a new brilliance; the sky was a clear blue, and utterly still. The darkness was frightening. The heart became forlorn.